President Donald Trump on Wednesday announced he was revoking the security clearance of former CIA Director John Brennan, a prominent and frequent critic, citing what the president called his "erratic conduct and behavior." Press secretary Sarah Huckabee Sanders made the announcement at the start of a previously unscheduled media briefing at the White House. She said Trump is also considering taking the same highly unusual action against nine additional former national security officials - all Trump critics - who served in the Obama or George W. Bush administrations, or both. "Any benefits that senior officials might glean from consultations with Mr. Brennan are now outweighed by the risks posed by his erratic conduct and behavior," Sanders said, reading from a statement by the president. That statement also alleged that Brennan "has recently leveraged his status as a former high-ranking official with access to highly sensitive information to make a series of unfounded and outrageous allegations - wild outbursts on the internet and television - about this Administration." [post_ads]It continued: "Mr. Brennan's lying and recent conduct, characterized by increasingly frenzied commentary, is wholly inconsistent with access to the Nation's most closely held secrets and facilitates the very aim of our adversaries, which is to sow division and chaos." Brennan soon responded on Trump's favorite medium, Twitter: "This action is part of a broader effort by Mr. Trump to suppress freedom of speech & punish critics. It should gravely worry all Americans, including intelligence professionals, about the cost of speaking out. My principles are worth far more than clearances. I will not relent." 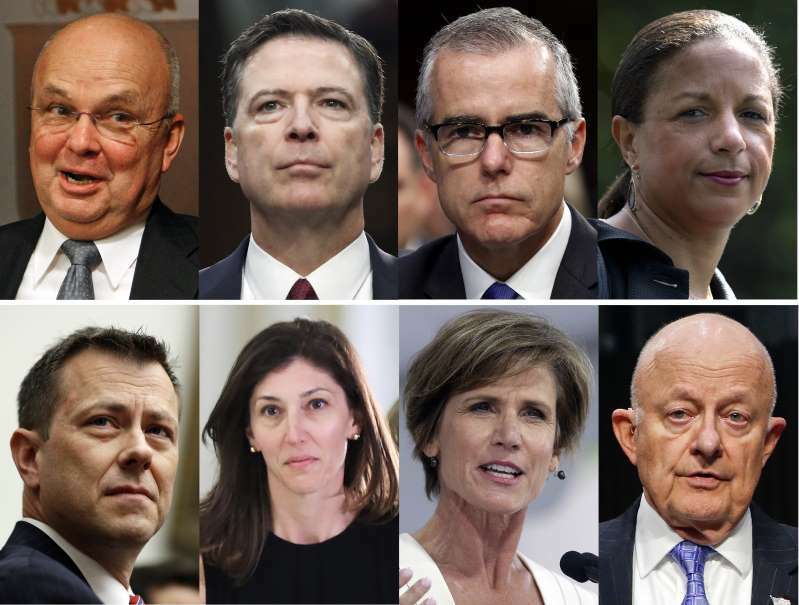 Many of the additional former officials on Trump's target list said that they already had relinquished their clearances. Yet the threat by Trump, even if largely symbolic, spoke to his willingness to use the powers of the presidency to punish his critics. The maneuver drew immediate criticism in both parties, though congressional Republicans are unlikely to challenge the president. Sanders named nine more individuals whose clearances are also under review: James Clapper, former director of national intelligence; former FBI Director James B. Comey; Bush national security adviser Michael Hayden; former Deputy Attorney General Sally Yates; President Barack Obama's national security adviser, Susan Rice; current Justice Department official Bruce Ohr; former FBI Deputy Director Andrew McCabe; former FBI agent Peter Strzok; and former FBI attorney Lisa Page. Comey, Yates, McCabe and Strzok all were fired by Trump. Only Ohr remains in the government. Former national security officials often retain clearances to enable them to continue advising the White House and Congress, or to maintain helpful ties to foreign officials. Brennan's tenure as CIA director capped a quarter-century career at the agency, including postings in Asia and as the station chief in Saudi Arabia. He is fluent in Arabic. As Obama's homeland security adviser, before becoming CIA director, Brennan was central to the months-long covert effort that ended with the killing of al-Qaida leader Osama bin Laden. Appearing on MSNBC after Trump's action, Brennan said: "I've seen this type of behavior and actions on the part of foreign tyrants and despots and autocrats in my national security career. I never thought I would see it here in the United States." In what could have been his final provocation for Trump, late Tuesday on MSNBC, Brennan called Trump "dangerous to our nation" and "the most divisive president we have ever had," who has "badly sullied the reputation of the office of the presidency." Sanders denied that the action against Brennan was retribution or an infringement of his free-speech rights, contending instead that the decision was a matter of protecting classified information. "The president has a constitutional responsibility to protect classified information," she said. Sanders cited as a rationale for the president's action Brennan's denials, as CIA director, that agency employees in 2014 had improperly searched Senate computer files amid the Senate Intelligence Committee's investigation of the Bush-era program for harshly interrogating terrorism suspects. Ten CIA officials did get access to the files, and Brennan later apologized to the committee. The president's statement on Brennan was dated in late July, just after Sanders first told reporters that Trump might revoke the clearances of several of the critics named Wednesday, including Brennan. By waiting weeks to release it, the administration was widely seen as trying to shift the public's focus: This week the White House has been roiled by attention to the president's feud with former aide Omarosa Manigault Newman, who has called him a racist and released secret recordings of conversations with him and others, and by news from the trial of Trump's former campaign chairman, Paul Manafort. "This might be a convenient way to distract attention, say from a damaging news story or two," Sen. Mark R. Warner of Virginia, the lead Democrat on the Senate Intelligence Committee, tweeted. "But politicizing the way we guard our nation's secrets just to punish the president's critics is a dangerous precedent." Hayden, the former Bush adviser, said in an interview with the Los Angeles Times, "It's disappointing that the president would do this. I do think he's trying to change the narrative because it's not been a really good week so far. "Denying someone a clearance because they criticize the president isn't warranted, although the president has absolute authority to grant or not grant," Hayden said. "I just think it's another example of using authority in a way that's not productive." Hayden said that the president's action against Brennan and the threat to similarly punish him "isn't going to affect anything I say or do going forward." Clapper echoed that sentiment on CNN: "If they are saying that the only way I can speak is to be in an adulation mode of this president, I'm sorry, but I do not think I can sign on for that." Brennan, who is paid by NBC News to serve as a national security commentator, hasn't limited his criticism to television. He also has written scathing messages on Twitter. The former CIA director's latest tweet, on Tuesday, excoriated Trump for his own tweet that morning dismissing Manigault Newman as "that dog." As if writing directly to Trump, Brennan wrote: "It's astounding how often you fail to live up to minimum standards of decency, civility, & probity. Seems like you will never understand what it means to be president, nor what it takes to be a good, decent, & honest person. So disheartening, so dangerous for our Nation." If Trump's move was meant to change the subject, it worked at least in the short term. Following her announcement, Sanders answered a few additional questions on other topics and none on the subject prominent at her briefing a day earlier - whether a recording exists, as widely rumored, of the president using a racial slur. On Tuesday, Sanders told reporters that she couldn't "guarantee" that such a recording does not exist. National security experts and government veterans from both parties have been among the most vociferous Trump critics, with the Republicans among them forming the backbone of the so-called Never Trump movement. [post_ads]Kori Schake, who held several positions in President George W. Bush's administration, called Trump's actions on revoking clearances "petty, designed to be intimidating to others, precluding talented people from giving our government their judgment, and eroding the norms of behavior that sustain bipartisan cooperation on national security issues." The Republican-controlled Congress is unlikely to rebuke Trump for the action, though members from both parties had warned Trump against it. The chairman of the Senate Foreign Relations Committee, Sen. Bob Corker, R-Tenn., last month had called just the threat from the White House a "banana republic kind of thing." House Speaker Paul D. Ryan, R-Wis., who often tries to ignore or brush off Trump's actions that he opposes, told reporters last month, after Sanders relayed the initial threat, that he did not think the president would go so far. "I think he's trolling people, honestly," Ryan said with an awkward grin. But, he acknowledged, "this is something that's in the purview of the executive branch."